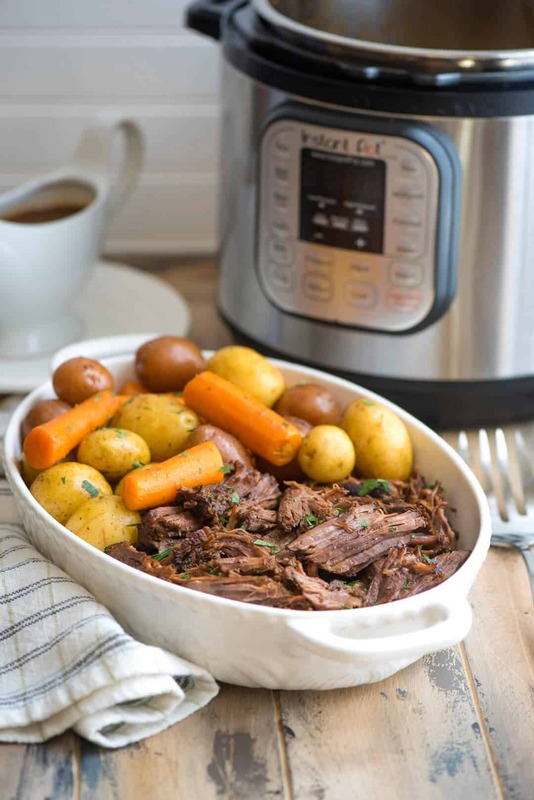 Incredibly tender, melt-in-your-mouth pot roast in about an hour is possible with the help of your Instant Pot and a few tips and tricks. 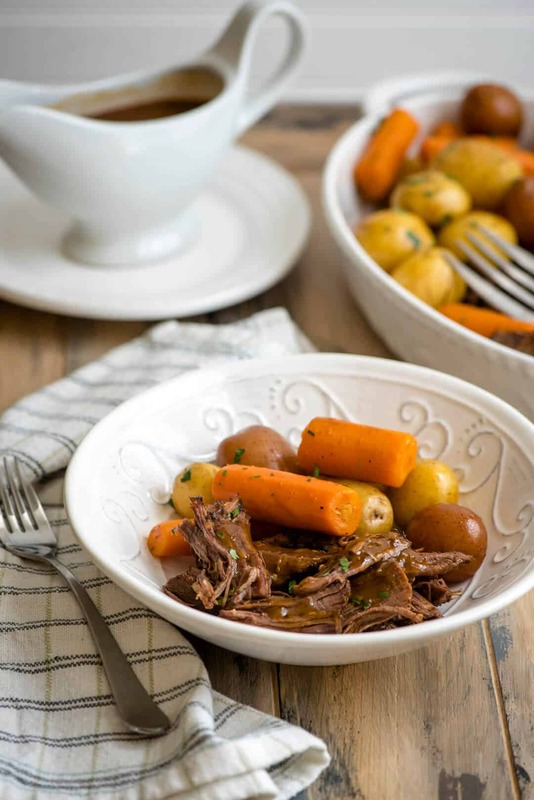 This Instant Pot Pot Roast with carrots and potatoes and a luscious, flavorful gravy is just what is in order for the cooler fall and winter months. 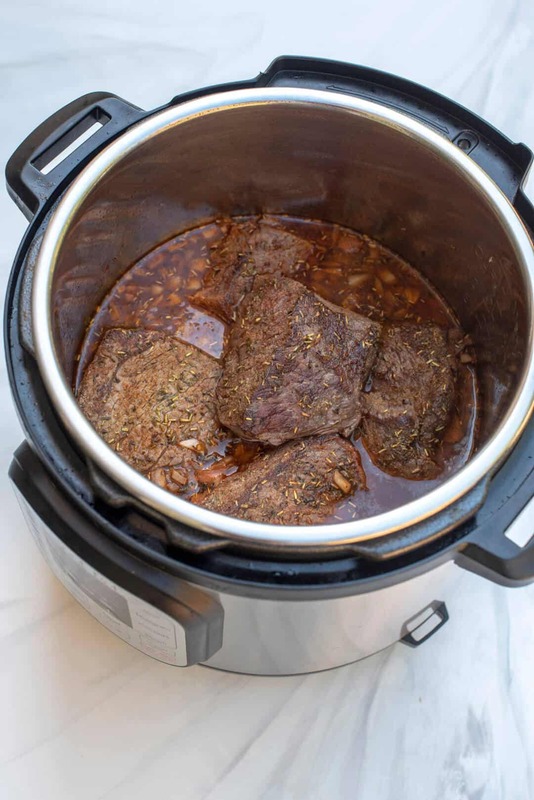 I was bound and determined to create a recipe for pot roast using my Instant Pot that would be fast, easy, and flavorful. I’m thrilled with the result and so happy to be sharing it with you today! I’ve been told by the folks in my house that this is the best pot roast they’ve had. This is a big statement as there have been a whole lot of pot roasts cooked up in my kitchen. There are several things about this recipe that set it apart from others in the flavor department and make it super fast to prepare. I’ve set all of these things out in this post for you with the hope that you can duplicate the result perfectly. Pot roast is such a comfort food classic. I think we all grew up eating our mom’s or grandma’s version which was most likely cooked on the stove or oven or both. The Instant Pot allows you to reach that same tender result but in a fraction of the time. No more having to start a meal like this in the early afternoon. You can literally have this on your table in just over an hour which is pretty darn incredible. Chuck roast is the most commonly used cut of beef used in pot roast recipes. Chuck is from the front part of the animal and different cuts will be labeled as blade, boneless cross rib, top blade, bottom blade, and shoulder. There are even different names for the same cut and it can differ from store to store – I know… so confusing! 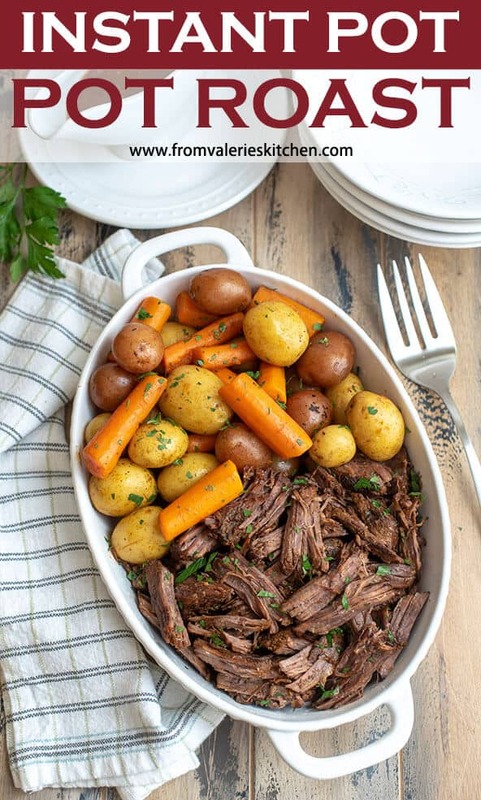 While you might instantly think of the rectangular, highly marbled chuck roast widely available at most grocery stores, some of the other cuts are also a great choice for pot roast. The popular rectangular cut of chuck will have a large amount of fat both around the edges of the cut and running through it. I have used this cut with great success in this recipe and nothing rivals it in terms of a tender result but it takes a bit more prep to make it work well (see below). Since a big part of my end goal in this recipe is to create a luscious, fuss-free gravy, I went with a boneless chuck cross rib roast, aka, shoulder roast (pictured above), this time around. It is a leaner cut of chuck which means less trimming of fat before the cooking process and cleaner drippings that will result in an effortlessly perfect gravy. Rump roast, which is obviously not from the front portion of the animal, is another cut that will work here. This was my mom’s cut of choice for her roast and a much leaner cut than chuck. This recipe has not been tested with a rump roast and it’s possible it could need a longer cook time. Certified Angus Beef has detailed information on the specific cuts that are best for braising. Check it out HERE. I suggest you give the different cuts a try for yourself and see what works best for you. Pick up what is on sale and give it a whirl. Regardless of the cut you use, I’m going to tell you how to prep the meat for success in this recipe. This seriously killer dry rub is part of what makes this recipe so special. This mixture adds a TON of flavor to both the roast and the gravy. The amounts called will make exactly the amount needed for this recipe but it can be mixed up in advance and stored in an airtight container to save time. 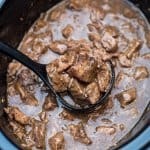 One of the goals of pressure cooking is to speed up the cooking process and cutting large cuts of meat down into chunks is the best way to achieve this. It can cut the cooking time in half versus tossing in a whole roast. 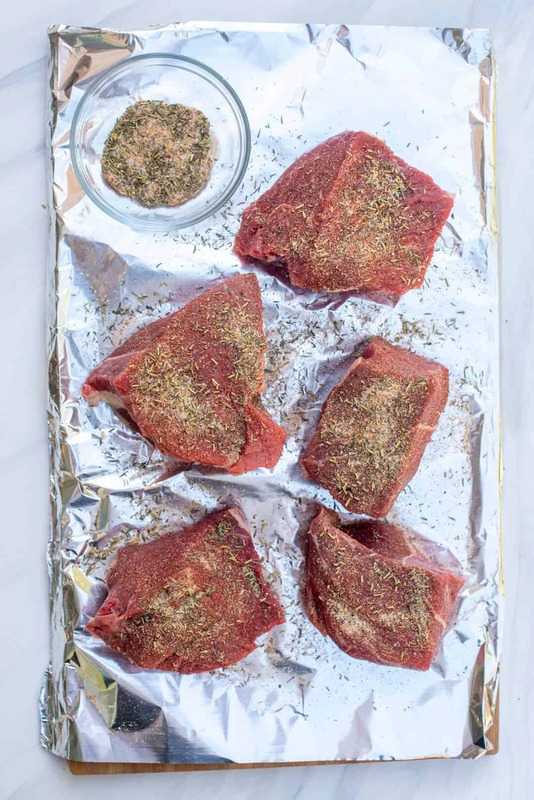 The other benefit is that you can season the individual chunks with the dry rub, covering more surface area of the meat which means more flavor. It also gives you the opportunity to more effectively trim the fat which will yield a better gravy. Using a sharp knife, cut the roast into 4 to 6 chunks. How many chunks will depend on the size of your roast. If you are using a highly marbled cut of chuck, cut it at the seams where you see veins of fat running through it. Trim and discard the fat from all the edges of each piece. Just do the best you can. There will be small fat deposits left and that is just fine. If you are using a 4 pound highly marbled piece of chuck, you may end up trimming as much as 1/2 pound of fat. This is one of the reasons I prefer using a leaner cut of chuck. They are easier to trim and you’ll end up with more meat. More bang for the buck! And, trust me, it will still get tender. None of these cuts stand a chance against the Instant Pot. Sprinkle the dry rub over both sides of the chunks of beef and use your hands to press it into the surface of the meat. I like to do this on a foil lined board for easy cleanup. 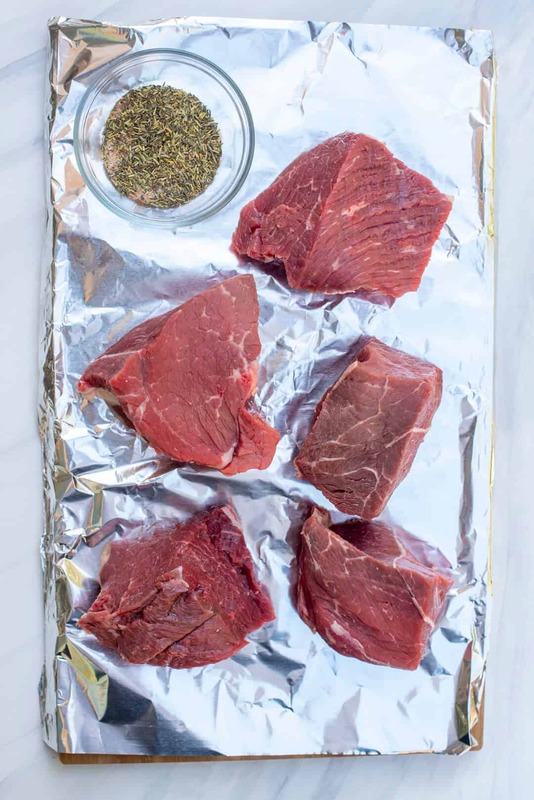 Next, you’ll use the sauté function on your Instant Pot to sear the seasoned beef chunks in a little olive oil in batches, if necessary, to avoid overcrowding the pot. The seared beef is set aside while you sauté some diced onion and garlic. Then in goes some tomato paste, a little red wine, beef broth, and Worcestershire sauce. Flavor baby! The seared chunks of beef are added back to the pot and tucked down into the liquid. Because the meat has been cut down and will cook much faster, you can add the carrots and potatoes at the beginning of the cooking process. This means the pot only needs to come to pressure and release pressure once and saves you about 15 to 20 minutes. Look for substantial carrots and cut them into large 2″ to 3″ pieces. I used The Little Potato Company’s Dynamic Duo creamer potatoes. They are small so they should be cooked whole. If you are using larger potatoes you can halve or quarter them, depending on their size. Add them to the Instant Pot right on top of the meat. They should not be completely immersed in the liquid but instead, layered on top of the chunks of meat as they cook. Bring the pot to pressure and cook on Manual for 35 minutes. See the printable recipe card below for all the details on finishing this off and whisking up the easy gravy. If you try this recipe I’d love to hear how it worked out for you. Now, go forth and eat pot roast! Cut the chuck roast into 4 to 6 chunks, separating at the seams to expose the fat deposits (if using a highly marbled chuck roast). Use a sharp knife to trim as much of the fat as possible from the chunks of roast. It's fine if some fat remains but trim as much as you can to ensure that your gravy will not be overly greasy. 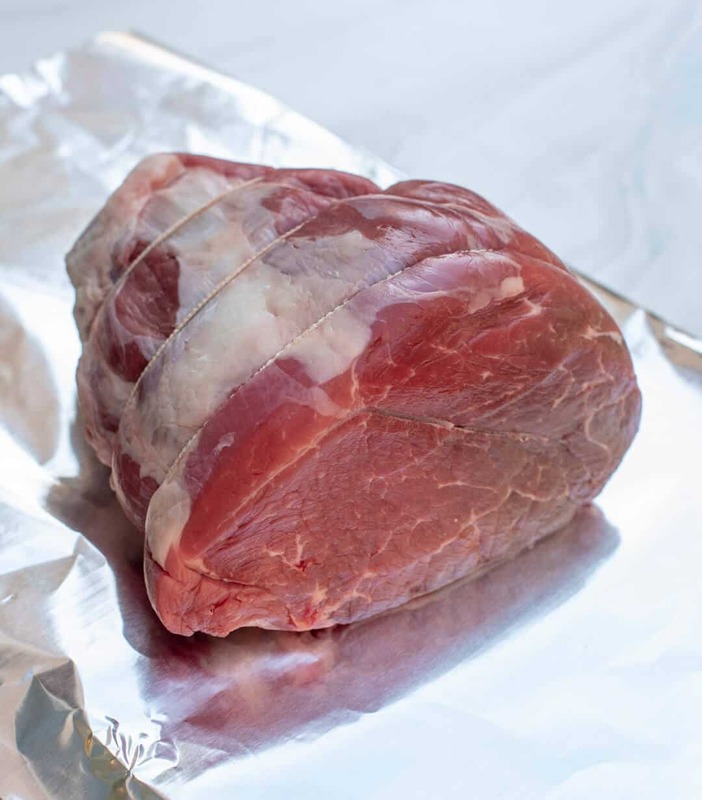 Place the trimmed chunks of roast on a large piece of foil for easy cleanup. 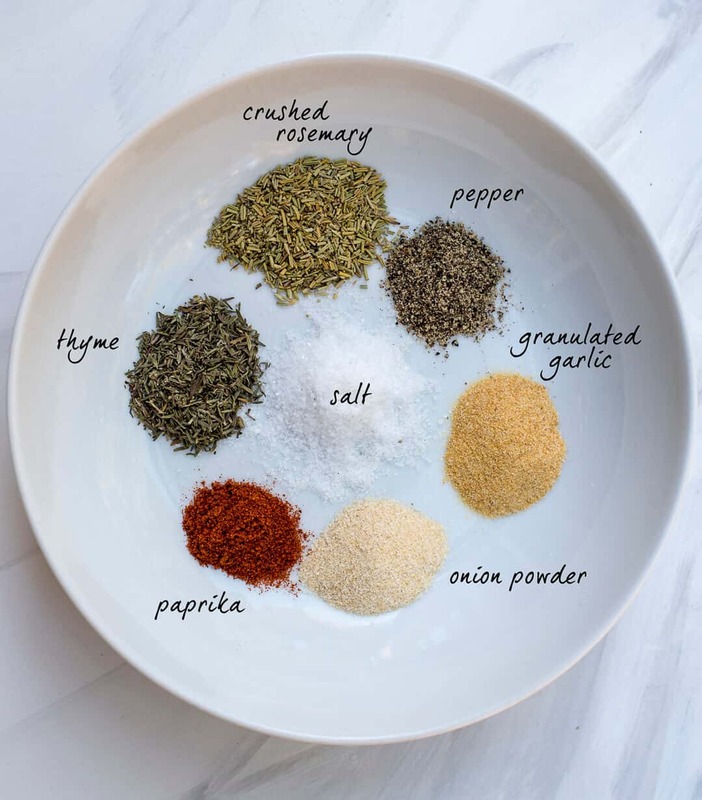 Combine the spice rub ingredients in a small bowl. Sprinkle the rub over the pieces of beef and use your hands to press the seasoning into the meat. Wash those hands! Press the SAUTÉ key on the instant pot and the ADJUST key to toggle to the MORE setting. Wait for the pot to say "HOT" before adding ingredients. Add 2 tablespoons olive oil to the heated pot. Add half of the seasoned beef (or as much as will fit comfortably without being too crowded) and sauté for 2 to 3 minutes per side, or until nicely seared. Transfer seared beef to a plate and repeat with remaining 1 tablespoon oil and the rest of the beef. Transfer second batch of beef to the plate and set aside. Press CANCEL and then select SAUTÉ again and ADJUST to the REGULAR setting. Add the onions and garlic to the pot and sauté for 2 to 3 minutes or until tender. Add the tomato paste and cook, stirring to scrape up any browned bits from the bottom. Add the red wine, broth, and Worcestershire sauce. Nestle the chunks of browned beef down into the sauce and then top with the carrots and potatoes. Don't stir. You want the meat submerged in liquid and the carrots and potatoes on top. Place the lid on the Instant Pot. Press the MANUAL button, select HIGH, and set the time to 35 minutes (making sure the steam release handle is in the "Sealing" position). After the cooking is complete allow the Instant Pot to do a natural release for 10 minutes then use a long handled spoon to push the steam release handle to the "Venting" position to allow any remaining steam to release completely before you open the pot. Press CANCEL. Transfer the carrots and potatoes to a serving dish and tent with foil to keep warm. Transfer the beef to a cutting board and let it rest while you make the gravy. Press SAUTÉ and ADJUST to select the LOW setting Stir 1 cup water into the very concentrated cooking liquid in the Instant Pot to dilute it a bit. Taste and if needed, add additional 1/2 cup of water to dilute as desired. In a small bowl stir together 2 tablespoons water and 2 tablespoons cornstarch. Whisk the mixture into the Instant Pot and simmer for about 5 minutes or until the gravy has thickened to your liking, stirring occasionally. Press CANCEL and unplug the Instant Pot. Transfer the gravy to a gravy boat. Shred or chunk the roast and serve with the potatoes, carrots, and plenty of gravy! 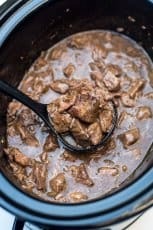 This recipe was tested in the 6 Quart Instant Pot DUO60. Other models may have different settings than those listed in the recipe. Blot the beef dry with paper towels before cutting into chunks and seasoning. Dry beef will sear better when it hits the oil. Cook time doesn't include time it takes for the Instant Pot to come to pressure or to naturally release which should take about 10 to 15 minutes in total for this recipe. Please consider this when timing your meal. If gravy is not as thick as you'd like after simmering with the cornstarch slurry, mix together an additional 1 tablespoon water with 1 tablespoon cornstarch and whisk it in to the thicken further. Your question is not dumb at all, Tina and I’ve edited the recipe so that hopefully it is more clear. Cabernet Sauvignon is my favorite variety of full-bodied red wine. You should be able to find a very nice bottle for under $15 at your local grocery or liquor store and there should be someone who can steer you in the right direction wherever you shop. Here is a tip for anyone who wants to cook with wine but doesn’t enjoy drinking it. Once you open the bottle it will spoil quickly so pour any leftover wine into ice cube trays and freeze them until solid. Then you can crack the cubes into a freezer safe plastic storage bag to keep on hand so you don’t have to go out and buy another bottle of wine for your next recipe. Thanks for starting my day with a chuckle, Carol 🙂 Don’t you love recipes that give you an excuse to open a bottle of wine? I used Yellow Tail Merlot. It came out fine for $7 / bottle. Its easy to find too. Loved this recipe. I had close to 4lb of meat and bimped the cooking time up to 35 min. It came out perfect. Thanks Valaries Kitchen. So many great seasonings in this I bet the gravy is yummy, too! With all the step by step photos, this is so helpful. Aaaand yummy! It looks perfect! I seriously need to try this! Absolutely delicious! 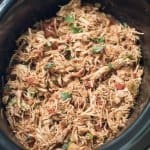 The instant pot is amazing and I love finding new recipes to try out like this one. 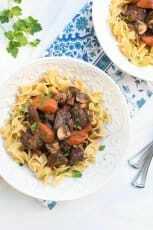 Pure comfort food and so tender with the instant pot. Great fall recipe! Another good one for the Instant Pot- thank you! 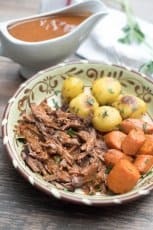 This is such a spectacular Instant Pot roast recipe! Even my picky eaters totally approve on this one! The Instant Pot is so life changing! Love this recipe! Amazing! 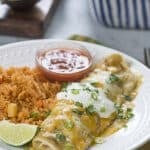 So quick, easy & delicious! The meat was so tender & the veggies were perfect. I added some sliced mushrooms. Definitely adding this recipe to my instant pot favorites. Thanks! I’m so glad it worked out so well for you, Jenn! Thanks for the feedback. This is on my list to make! Love! The flavor is delicious. I’ve finished making the gravy, and I’m putting the roast back in the instant pot to cook a little longer. I had a good 4 pounds of meat, and I think it needs more time to achieve that “melt in your mouth” feel I’m going for. Next time I make it, I might stop the pot after 15 minutes of cooking, take out the vegs and then put the roast back in for additional time. This is an outstanding pot roast preparation. I added large frozen pearl onions (Trader Joe’s) at the end for extra texture. 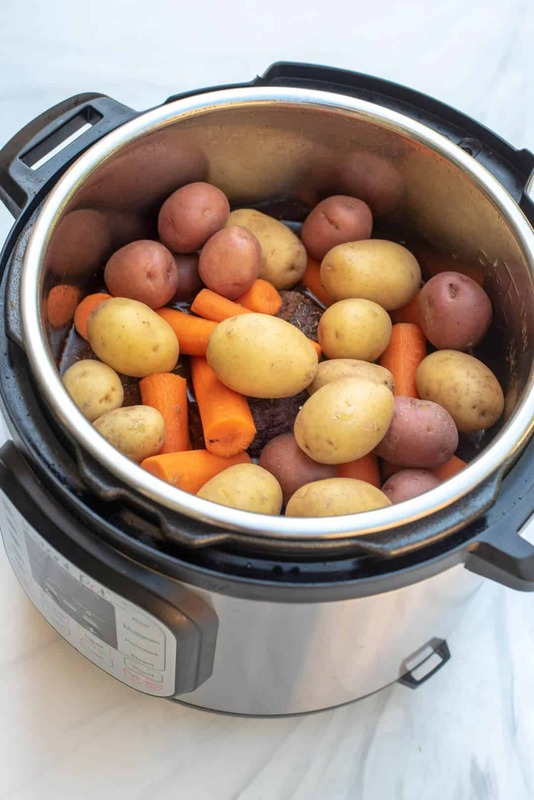 Love making pot roast in the Instant Pot! This is such a great recipe. So much flavor. 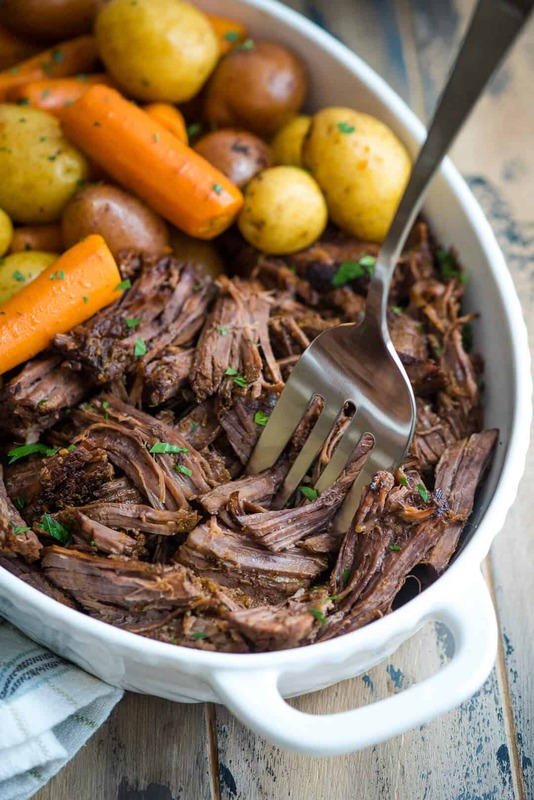 Nothing beats a classic pot roast and I’m loving how easy this is in the Instant Pot! 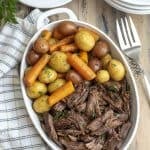 The flavor in this pot roast was amazing! I love how it’s classic! I tried this recipe for the first time tonight. The carrots were a touch soft for my taste, but the potatoes were perfect, and the meat was so tender and flavorful! I will definitely use this recipe again, and just put the carrots in a bit later. I was craving pot roast, and this definitely hit the spot! Oops, forgot my rating. 5 stars for sure! Everything is so perfect and tender! Great flavors! This was amazing! Thank you for sharing your recipe. Will definitely make this again! 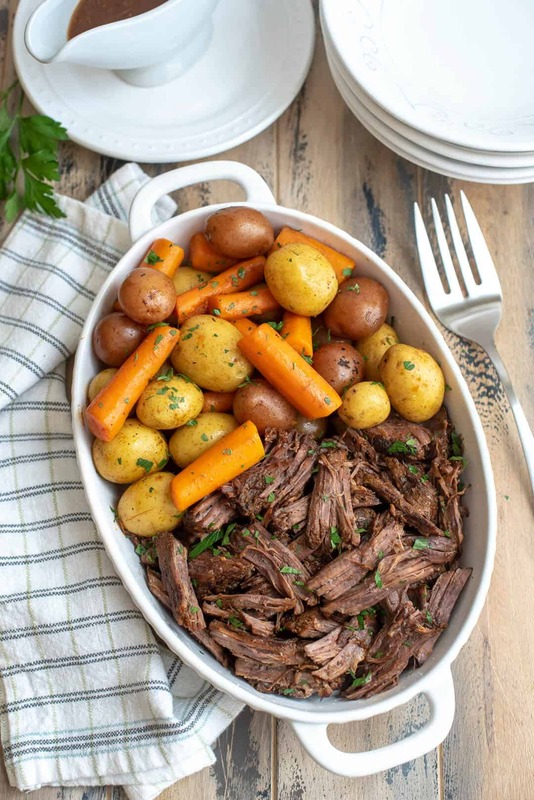 This pot roast is so tender! It’s perfect and so easy to make. This was the first time for me to make a roast in my Instant Pot and it was delicious!! 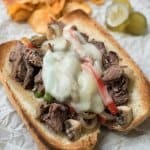 I was looking for a recipe that would yield a fall apart, melt in your mouth roast and this recipe did not disappoint. I did omit the wine because my tummy always rejects anything made with wine, but this omission did not affect the taste of the roast. Thank you for sharing this recipe, it’s a keeper!! We substituted turnips for potatoes and Coconut Aminos for Worchester because we try to follow a Paleo diet. It was our first Paleo Instant Pot recipe, it was great. The turnips give off water where potatoes tend to absorb water so there was no need to added water at the end. Turned out great. Gravy never did thicken though even with additional cornstarch addition. Will use it as sauce with noodles tomorrow. The roast turned out great as far as flavor and tenderness however the meat itself was very dry. I cooked it exactly to your recommendations. Any advice? I’d be interested to know which cut you used. Most cuts of beef will be very tender after cooked in a pressure cooker. This was pot roast perfection! Thanks for the recipe. The pot roast was delicious but I wasn’t a fan of the gravy. Will make again with different gravy. This was an amazing pot roast! My wife usually won’t eat roasts but the whole family loves this recipe. I followed the directions exactly with an arm roast and I will definitely make this again. First meal in my instant pot and loved it. My husband said this is a keeper. Followed it exactly. Turned out delicious. If I wanted to omit the carrots and potatoes and just cook the meat will the cook time be the same? Can’t wait to try it! It was delish! I added a few things such as celery, caramelized garlic and pearl onions when I seared the seasoned rubbed meat. It came out perfect and the meat was falling apart, so tender! Probably the most flavorful pot roast I’ve ever made. Followed the recipe for the rub. I opted to pressure-cooked the roast with a few veggies (flavor) for about 50 minutes (and could’ve done longer because I like VERY tender meat). I opted to roast the majority of veggies in duck fat in the oven rather than chance in the Instant Pot. But the roast and gravy were spot-on spectacular! I will be making this again!!!! 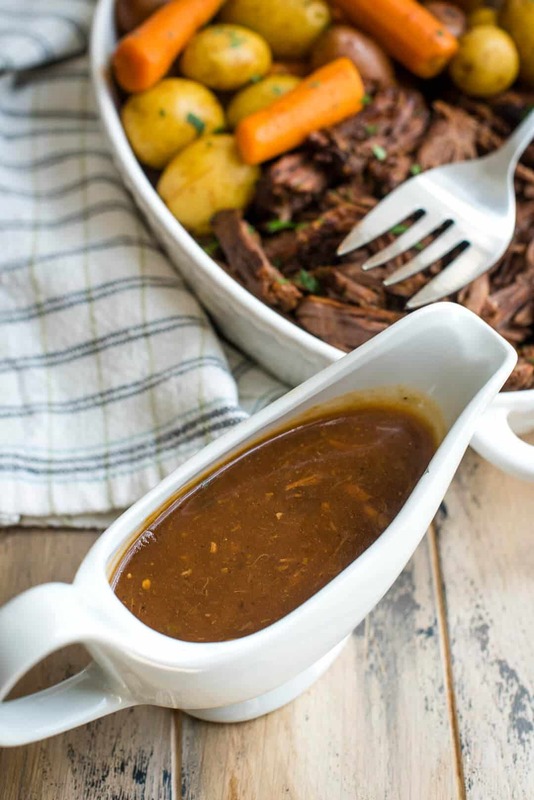 I love how easy it is to get an amazing pot roast in the Instant Pot! Delicious but the carrots and potatoes were too soft, I dropped the pot after the last time I used it and it seemed to take a long time to come to pressure and I’m wondering if it overcooked. It was still most delicious. I’m 73 years old and this is the best pot roast I’ve ever made! Usually the leftovers sit in the fridge for a few days before being tossed, but not this time. Thanks for a great recipe! New to IP. Having a great time. This is definitely a “do it again ” recipe. Thank you for your love of cooking and sharing with us. Good music and cabernet with super, heaven. Is the cook time the same even if you don’t cut the chuck roast? It will definitely take longer. I’d probably be inclined to double it and cook it without the carrots and potatoes. New to IP. THIS was our second meal in the instapot. Great recipe , very nice flavor. this is a keeper. I left pressure on to long so the potatoes were a bit mushy. but meat was very tender, flavorful.. I make gravy differently. I ladle the liquid into a pitcher through a strainer. I then whusk in the cornstarch after which I nuke the mixture for 30 seconds, whisk, wash, rinse, repeat until I have the consistency I want. I seldom add water unless absolutely necessary. We are making this for the first time tonight. This is our second meal in our Instant Pot Abe I am a little newto all of this. You said hit Manual for 35 minutes. We do not have that button and we were debating between the “Meat/Stew” button or the “Pressure Cook” button. Is that correct? I guess we will find out in 30 minutes or so! Sorry my response is coming a little late but I think you’d do fine with either. Generally though I’d go with the Pressure Cook setting. This is an excellent recipe. Thank you so.much! My husband declared it was the best pot roast I had ever made. I loved the luscious, rich gravy. BTW: this is only the second thing I have made in my IP. 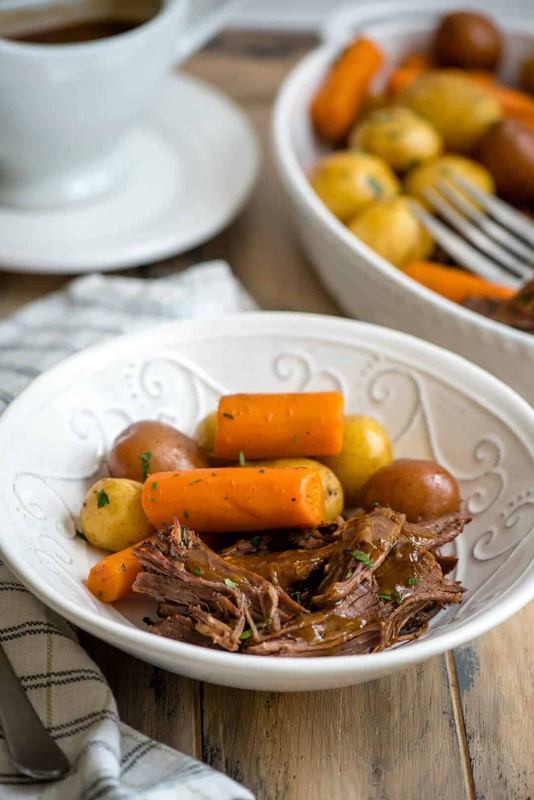 Thank you for sharing this phenomenal pot roast recipe! This is very first meal I prepared with my Instant Pot. The recipe is easy to follow and turn out absolutely delicious. If I wanted to add cabbage, would I add that at the same time I do the potatoes and carrots? I don’t think a 6 quart Instant Pot is big enough to hold the meat, potatoes, carrots and a quartered head of cabbage so I’d be inclined to hold them back and cook them separately after the meat has cooked. I haven’t tested this but I’d guess they would only need about 5 to 10 minutes if they are cooked immersed in the cooking liquid left behind after cooking the meat. I’m not one to usually leave a rating on recipes. But this was the best pot roast I’ve ever made. I Usually tweak most recipes I resisted the urge to tweak this one because it sounded so good. It was outstanding. Thank you, Richard. I’m so happy to hear this! Soooo impressed! This turned out perfectly. If I hadn’t made it myself, I would not have believed how juicy this was and completely falling apart in this short of time. Best pot roast I’ve ever had, hands down! This recipe turned out absolutely amazing!!! I never have luck with making a tender pot roast and definitely never make my own gravy. I will be keeping this recipe to make over and over. My husband loved it! Thank you! 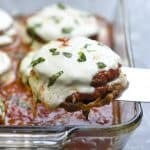 Made this for family and we had no leftovers (sadness for my husband who loves leftovers) but was so glad I tried it and the advice was so on point. I needed them as I have not been successful with pot roast in the IP. Now I think I can be more confident in making a pot roast that will be consistent as your recipe is the best I’ve found. Thank you from my whole family!!!! Hi! I made this tonight and my family loved it! It was my first time using my Instant Pot. I did notice that the liquid did not reduce and the meat was a little dry. I followed the recipe completely… although I used rump instead of chuck. Could that have been the problem? Thanks! Yes, definitely! A rump roast has less fat running through it so it can be tougher even after cooked than a chuck roast. I recommend trying it again with a chuck for a super tender result. Fabulous recipe. Very impressed. What would you guess the Weight Watchers points would be? I’m new to instapot as well as weight watchers. So glad you liked it, Tippi! I’m not at all familiar with WW but I believe there are calculators online? Yum yum yum!! I didn’t have potatoes and only had a 2.25 lb chuck so there was a lot of liquid, but it made a really tasty stew! The meat needed some more time to fall apart, but since it turned more into a soup, we didn’t mind and it’s was nice and tender. The broth is so good. I’m definitely saving this recipe! My husband doesn’t like Pot Roast but eats it occasionally since I love it. After a couple bites he said, “Now, this is good!” and my kids liked it too. Thank you! Oh my Goodness this was absolutely amazing so delicious. 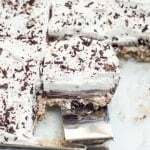 Thank you for sharing this recipe I will make it again and again. This was only the 2nd time using my IP and Love it. hi! would the cooking time be the same for a frozen chuck roast? Hi Maline. No, it would definitely take longer but without testing I can’t say how long. I think for the best result and for timing it to cook along with the carrots and potatoes the meat should be fully thawed when you start. My IP doesn’t have an Adjust or Manual Setting. What settings should I be using for Sauté-ing and then finally cooking everything? Excited to try this one! Hi Jack. If your IP has a sauté you can use whatever setting is available to you. If not, just follow the recipe as written but do the portion that requires sautéing in a skillet on your stovetop and then transfer it to your IP. A bit more work but it should work out just fine. I have the sauté setting. It’s the next step that I am not sure about. Should I be using the Pressure Cook button or the Meat button once everything is sautéd and ready to be cooked? For how long? Okay, gotcha! You should use the Pressure Cook button in place of the Manual button. Check out this helpful post that explains the button functions on different models. This recipe looks wonderful. I applaud you for addressing so many points in the preparation that many recipes that I have read omitted. 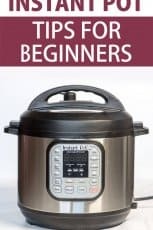 I am new to pressure cooking so all of these tips and nuances that you have included make me feel like I can do this with success while I am in an out this afternoon and evening getting three kids shuffled around town. Thank you for sharing! Turned out great, being a professional butcher I noticed in the pictures you’re using a chuck clod or a crossrib roast which like you said would make your gravy less greasy because there isn’t a lot of fat in it. However I think a traditional chuck pot roast is definitely the way to go with this recipe the fat that is marbled throughout the chuck is so flavorful and will keep the meat from drying out. I do believe that this is the best pot roast recipe that I have ever tasted!! I did not have any wine, so I just made the broth a little stronger. I also did not add any additional water to the gravy, but simply thickened the drippings in the bottom of the pot. The flavor was AMAZING and the beef was fork-tender!! Thank you for this lovely recipe….I have already copied it to pass on to my daughter! Maybe I did something wrong but the roast was totally dried out. I left the wine out as one of my friends doesnt like it but I substituted with more beef broth. Other than that I followed recipe. Absolutely Killer! I wanted to lick every plate and the instant pot itself. Don’t judge 👩‍⚖️! Gravy was sooo delicious.